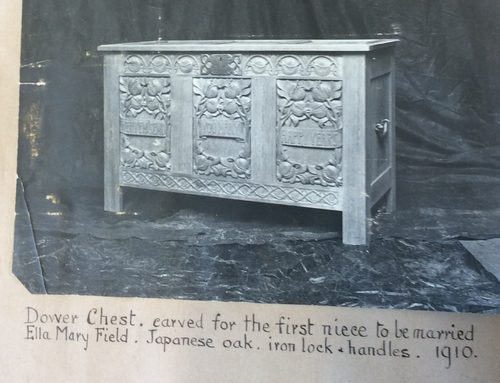 Dower chest carved 1910 for Ella Field . Who was Nellie Payne? Dower chest for Ella Field. Ella Field was the first of Nellie’s nieces to be married, and Nellie carved her first dower chest to mark this occasion. Mr Fred. W. Ratten, of Union Bank, son of the Rev. and Mrs Ratten, was united in the bonds of holy matrimony to Miss Ella Field, late of Launceston, recently of St Kilda, by Dean Stephen last week. The ceremony at All Saints’ church St Kilda, was very imposing, the bride being preceded by choir boys in surplice, singing the litany. After the ceremony the large number of guests proceeded to “Kara,” the residence of the bride’s parents, where the usual toasts were honoured. Mr and Mrs Ratten proceed to Brisbane, where he has been officially appointed in the service after being over twelve months at Port Moresby.